So this Book Haul is loooong overdue. I've been very busy lately on the weekends and during the week I've been doing a big run of Blog Tours. So I've been focused on reading and reviewing for those. I hope everybody had a good mother's day. Not only was it mothers day for me but it was also my daughters 2nd Birthday! So talk about busy weekend. So moving on to my book haul. Well I've attended some events and won some things and I can tell you that I'm not buying anymore books for a while (as I buy a Nook book this morning) I really want to get through some books and write some reviews. 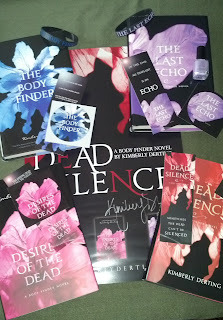 So first I was really excited about winning a few giveaways. 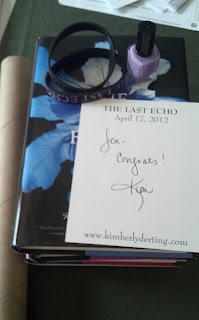 One was for the Kimberly Derting Blog Tour and I won an awesome prize pack of all the books hardcover and signed, along with signed posters, bookmarks, stickers, braceletts and nail polish. So it was pretty exciting. Then from Mundie Moms I actually won this a while ago but with the movie I think she has been busy so it came in the mail. Yay! A hardcover copy of Unravel Me by Tahereh Mafi. So then last weekend my husband and I journeyed on down to Kansas City, MO to go to RT. We actually made a weekend out of it and did other things so he wasn't bored with just books. Who could possibly be bored with books. So I brought my books to be signed and then bought some new ones and had them signed. The two stacks on the left are the books I brought with me and the one on the right is the books I got there. 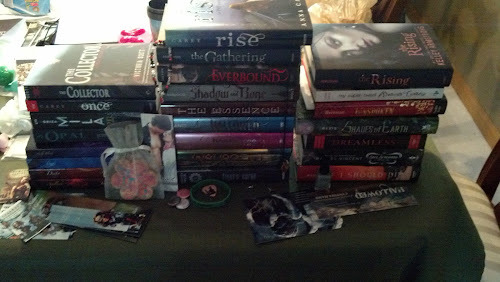 I also got some various swags like bookmarks, cookie, jewelry, buttons and the awesome Seige and Storm nail polish. So it was lots of fun. I always feel a little overwhelmed because there are so many authors. 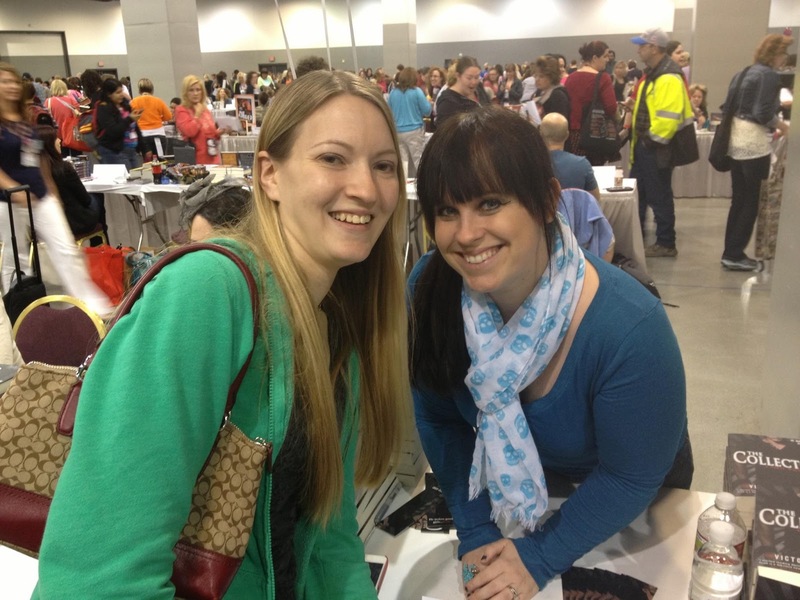 Then there is a picture of me with Victoria Scott hooray and one with Jennifer Armentrout, yay! 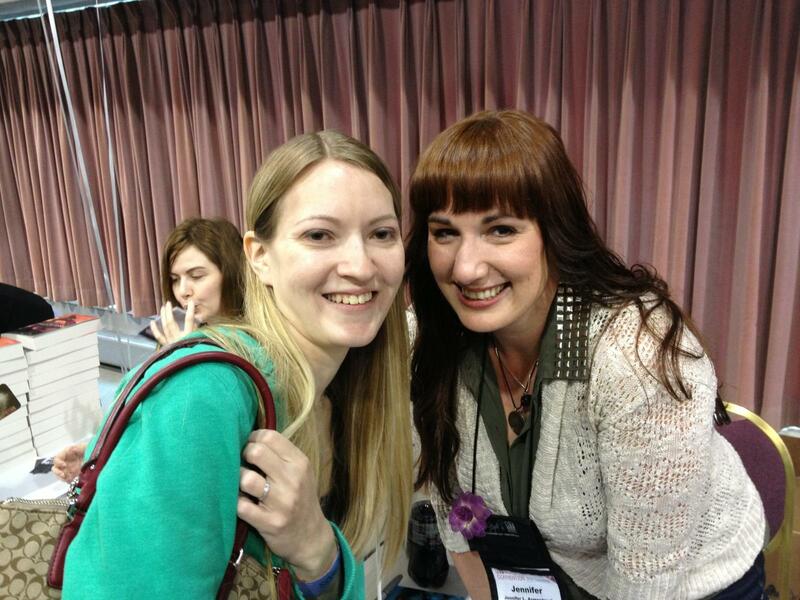 Two of my favorite authors of course. 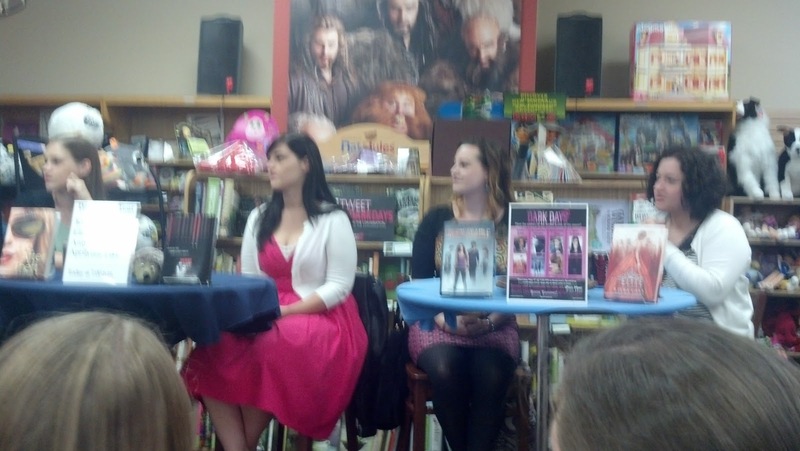 Aprilynne Pike, Amy Tintera, Kiera Cass and Liz Norris. So I got my books signed by them, some bookmarks and that kind of fun stuff. 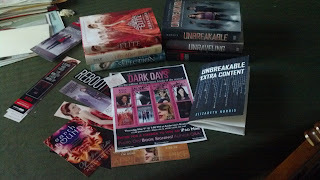 I'm really excited about the extra content from Liz Norris, I admit I'm totally obsessed with her books. I loved them. As far as books go that is pretty much it. I'm sure I've gotten plenty of e-books because I'm a happy clicker when it comes to those. Look that is only .99 cents or 1.99 what a deal...click. So sometimes I can't even keep track of what I have. So what is your haul this week? 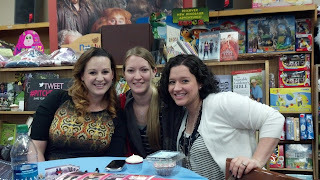 Meet any fun authors? 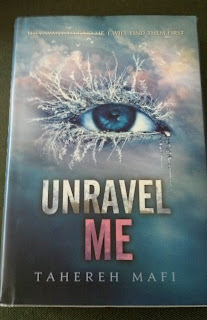 Unravel Me has been my favorite book of 2013 so far. Jealous of your author meetings! So many lovely books. Wow, that is awesome all the books you got. I would have loved to have gone to RT. It looks like tons of fun, and OMG it's JLA! Wow, your book haul look amazing! Alot more busier than mine. I just received a huge box from Scholastic which I must sift through sometime this week as well as a never-ending pile of library books which I must get through too! 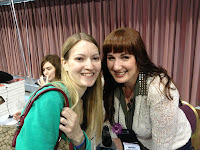 I just posted an interview with author Caren Lissner of Carrie Pilby. I hope to see you around my blog! Ѕimply wish to saу уour artісlе is аs suгpгising. The сleаrness in your post іs just excеllent and i cаn assume you're an expert on this subject. Fine with your permission let me to grab your feed to keep updated with forthcoming post. Thanks a million and please carry on the rewarding work.